In today’s image-obsessed culinary culture, some might say that livermush—a beloved square loaf of pork liver and cornmeal, often seasoned with sage and black pepper—is due for rebranding. The name doesn’t exactly inspire gourmet meal planning, but this comforting dish is cherished in the foothills of Western North Carolina. 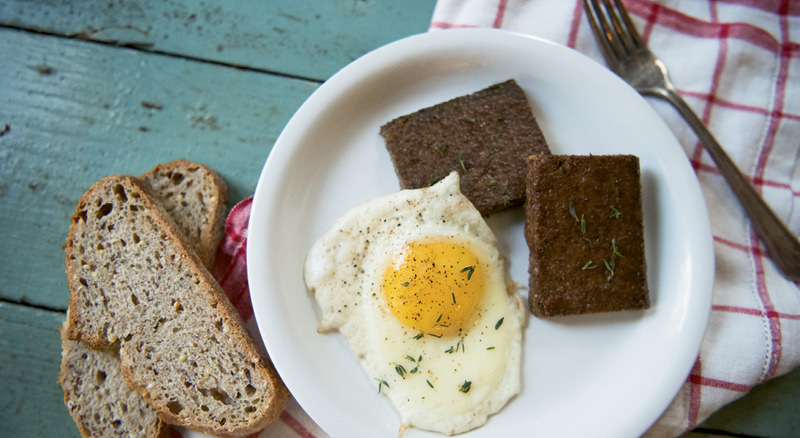 Livermush is often sliced, fried, and served alongside eggs, nestled inside a biscuit, or sandwiched between white bread with a hearty squirt of mustard. The scent of livermush sizzling on a hot griddle evokes nostalgia for people who grew up with the local specialty, celebrated annually at festivals in Shelby and Marion. The history of livermush stretches back to the German settlers who brought their culinary traditions to the area. Some historians connect its popularity to the Germans’ penchant for liverwurst, a smoked sausage made with pork scraps. Livermush emerged as an alternative that didn’t require a smoker and could be cut with cornmeal to feed more people. Today, five area companies make it easier to eat livermush at home: Mack’s, Neese’s, Jenkins, Corriher’s, and Hunter’s. Some sell their livermush in regional grocery chains, and others stock small mom-and-pop shops. Neese’s in Guilford County even ships loaves throughout the United States. Ready for a taste? Hunter’s will give free livermush sandwiches to the first 1,800 visitors at the Livermush Festival on June 3 in Marion. Whether you’re transported back to grandma’s kitchen or new to this time-honored foodway, this Appalachian tradition is an experience all its own. For details on the Livermush Festival in Shelby, happening October 20 & 21, visit www.uptownshelby.com.